Flickr/Richard and Jo Demeester. All rights reserved. Forty years have passed since summer 1974 and the Cyprus issue remains unresolved. What a shame for a country in which the number of international actors involved is disproportionate not just to the size of the island and its resources, but also to the hypocrisy employed by all those boasting that the plight of the island is due to the historic enmity between Turks and Greeks. Every July I cannot stop thinking of that morning of 20th July 1974. A young boy of eleven years old, born and raised on the Greek island of Lesbos, north-east Aegean and in very close proximity to Turkey, listening to his mother telling him that Turkish planes are flying over the village and that we may be invaded. My father was called up and left the house. He later explained to my mother (though I was listening hiding behind the door) how chaotic and disorganised this call up was and that Turkey, if it wanted, could have taken over not just Lesbos, but all of the Eastern Aegean islands (years later, in a seminar given in Chatham House in London by Bulent Ecevit, Turkey's PM at the time of invasion, it was confirmed that Turkey had plans to take over Chios, a Greek island just south of Lesbos, in the event of Greece assisting in Cyprus' defence). With my father absent, I was left alone for several days with my mother and 2-year old sister. I felt like it was now my job to take up the role of the protector of the family. Secretly, I took my mother's long knife from the kitchen and slept with it under my pillow, so I could defend my mother and my little sister from the possible barbaric invader. It was an extraordinary feeling. It made me feel so proud at that young age. Education in school boosted this feeling in the years that followed. Paradoxically, it was only thanks to my father, who pushed me into alternative political educations, that I began questioning the image of "barbaric Turks" and "angelic Greeks"; and also thanks to my grandmother, herself a refugee from Moschonissia, today's Cunda in Turkey, by the town of Ayvalik opposite Lesbos, that I realised how wrong was the nationalistic narrative about Greek-Turkish relations I was bred with. "Politicians", my grandmother used to say, "divide people". Read this amazing statement in light of the realist theory and practice of international politics, which postulate that the international system is anarchic and that every state unit in it aims at achieving conditions at the expense of the other using politics and strategies of "divide and rule". My grandmother knew better and well before realism became an established school of thought in the discipline of international relations after WWII: she and her family, together with Muslim families, lived peacefully in Moschonissia for centuries, but a combination of imperial and nationalistic policies, led by Lloyd George and Eleftherios Venizelos respectively, divided them. The Cyprus story is not far-off the mark. As we have shown elsewhere, Cypriot nationalism - whether Turkish or Greek - is the derivative of imperial and nationalistic (read: realist) politics rooted in the history of regional and European politics from the 18th century onwards and, undoubtedly, the policy of Britain in the 1950s, which pitted the Turks against the Greeks in an effort to hold sway on the island. Makarios was perhaps the only visionary leader of the "independent" Cyprus, the result of 1959-60 Zurich-London agreements. "Independent", because, unlike other statehood arrangements, Cyprus sovereignty was to be "guaranteed" by Britain, Turkey and Greece, and this was something that contravened the very charter of the UN. But in a realist world everything is possible and even legitimate. And when Makarios, the only sensible leader Cyprus possessed at the time, tried in 1963 to explain to his patrons that the Constitution was unworkable because of the equal veto rights given to his Turkish vice-President, Turkey threatened to use its guarantor rights to invade the island to protect the rights of its minority (18%). Makarios was alone. Pro-NATO mainland Greek politicians castigated him because they did not want a war with Turkey. Turkey was concerned with Makarios' victories at the UN, when the 186 UN Security Council resolution of 1964 ordered Makarios to impose order on the island since he was the only sovereign force. Cypriot nationalists, both Greek and Turks, hated him because the former believed that Makarios betrayed the cause of "enosis" (union with Greece) whereas the latter saw their dream of "taksim" (partition) withering away. Henry Kissinger abhorred him: for Kissinger, if Cyprus did not belong to a friendly NATO power, the security and defence of Israel could not be guaranteed (Makarios was one of the founders of the non-aligned movement and refused to provide assistance to the USA and Kissinger during the Yom Kippur war of October 1973). Makarios wanted a truly independent Cyprus, that is, to throw his small island-state into the world of the anarchic international politics of the time, ie, the Cold War, but independence he did not get. Refusing to accept Dean Acheson's plan for the division of Cyprus between Greece and Turkey, everybody had a reason to conspire to overthrow and eliminate Makarios as a factor in the politics of the Eastern Mediterranean. Eventually, he saw his state invaded by Turkey twice, on 20 July and 14-16 August of 1974. Turkey effected partition and forced ethnic populations to concentrate in the northern (Turkish Cypriots) and the southern (Greek Cypriots) part of the island, pretty much along the lines of the Greek-Turkish population exchange of 1923, the difference being that no international Treaty had sanctioned this population movement. Since then, things have become worse. Turkey and the Turkish Cypriot administration began fighting for international recognition. At the same time, Turkey encouraged thousands of Turks and Kurds from mainland Turkey to populate the abandoned houses of Greek Cypriots in the north (today the number of settlers in northern Cyprus outnumber the Turkish Cypriots). 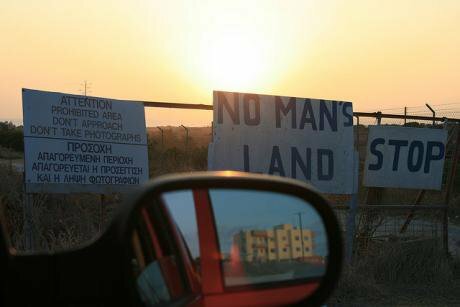 Greek-Cypriot governments, claiming that they are the sole legitimate governments representing the entire island, pushed for EU accession, which it achieved in 2004. But the interesting thing to note is that all attempts at a solution to the Cyprus issue - an issue that pre-dates the Turkish invasions of summer 1974 - involve high/elite politics and operate in the realm of realpolitik. The official narrative of the so-called "international community" (NATO, the EU, the UN), which many elites in Greece, Turkey and Cyprus have effectively espoused, goes as follows: Cyprus has been de facto divided since 1974 and too many settlers are now in northern Cyprus and many of them have children and even grandchildren born in Cyprus; history shows that Greeks and Turks cannot live together but since it is unfair to give too much territory to Turkish Cypriots given that before the invasion they amounted to just 18% of the population, any settlement should force the Turkish side to concede some territory, more or less along the lines of the Annan plan of 2002-04, which the Turkish Cypriots voted in favour but the Greek Cypriots against. But the principle of ethnic partition into two separate statelets connected through a loose co-federal Constitution with many governance layers, such as in Bosnia, should remain intact. This is the same old wine in a different bottle. The future of Cyprus, and of peace in Cyprus, should not rest in the hands of political elites, whether of endogenous or exogenous origins, or both. History has indeed proved the exact opposite of the official, realist narrative. It has indeed proved that Cyprus is the victim of the incompetence of all those past elites to provide a just and viable solution to the Cyprus issue along the lines of realist interests, i.e. national and imperial interests. We need to go back to the wisdom of my grandmother, that "realist politics is a divisive force" and try to move beyond realism. Do you want a solution to the Cyprus issue, and indeed of every similar issue across Europe? The only way forward is to move beyond the realm of realpolitik and to engage with civil society in a manner that raises the issue of solidarity and fraternity on the basis of the ontology that unites society itself, and these are the values of labour, family and anti-nationalist and anti-imperial education; re-discover and re-define diversity (ethnic, state, religious, gender) as being fundamentally resourced, and thus historically determined, by labour and re-production of life. All people, in this respect, are the same and can live peacefully side by side, provided that politics is a function of collectivity and social solidarity and not an elite function serving state/bureaucratic realist interests. It seems that my grandmother had sensed and rationalised something that contemporary social theorists have difficulties in understanding. These are the bases upon which new understandings and new forms of social democratic politics can be built and flourish. Children of 11 years of age should not be raised in conditions I was raised and should not feel the way I felt at the time. Victims of realpolitik themselves, these children may not be as lucky as I was having the family I had and the grandmother I had. These children may then become leaders of the extreme nationalist, racist and even anti-Semitic politics that endanger the very democratic premises of European politics today and of Greece in particular.